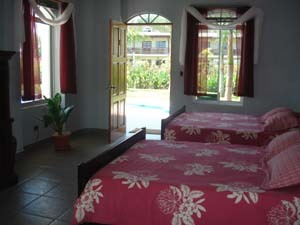 This is our Poolside suite with a kitchen area. 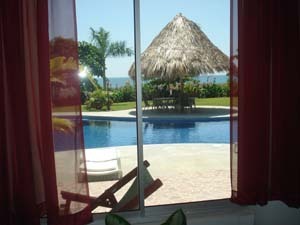 The suite sits ground level and overlooks our beautiful pool and gives you a great ocean view of playa hermosa. This one of our largest rooms with two queen beds and a set of bunk beds. It also has a kitchen area and a large fridge. 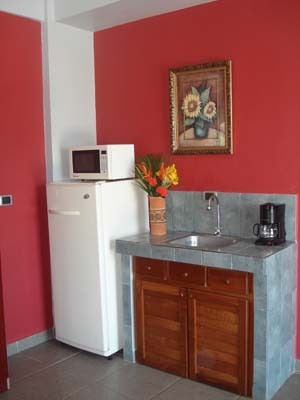 All of our rooms offer hot water, which may not sound like a big deal, but not all hotels in Playa Hermosa offer hot water. 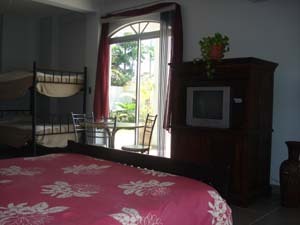 We also offer cable tv, ceiling fans, air conditioning, daily maid service, and in-room safe. With this view and size the pool side suite is perfect for the whole family.